Dear ICC! We often hear how you want Cricket to be more interesting and now we heard you have done few things for bowlers too. But, did you ever wonder why is it so tough for a bowler to be judged Player of the Match? On bowling track, a batsmen with low 50 even in low score runs away with MOM. On batting track, anyways its batsmen’s right to get MoM. Like yesterday, two batsmen scored world record T20I centuries. The winner of the match was decided by the bowler though. Still, even a child could tell that centurion from winning team will be MoM. Let us analyze through yesterday’s match analysis of last few overs. How many times have we seen that even in a very low scoring ODI or T20I a batsman from winning team runs away with the prize award of the match!! Uncountable times probably! How many times have we seen that bowlers win the prize award in a high-scoring ODI or T20I? Probably, one can count on fingers. Let us take the record breaking T20I at Lauderhill as an example. World record match aggregates were scored. Batsmen from both teams scored world record centuries. 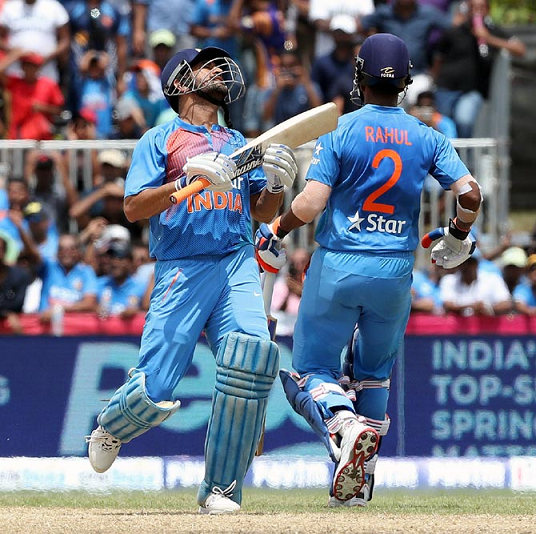 Despite the score of 245 runs on board, West Indies were clearly in danger as Indians needed just 8 runs in the last over. KL Rahul has already made the chase look easy after the end of 15th over. With the devastating Dhoni at other end, nobody would have been surprised if India had won with an over to spare. But, then came Dwayne Bravo to bowl two of the last three overs of the match, which was completely in control of Indians now. India needed just 33 runs from 3 overs with 7 wickets in hand. But Bravo gave only 9 runs in 18th over. India needed 24 runs from next 2 overs and Russell was milked for 16 runs. In the last over Indians needed only 8 runs. With the pair who had already added 100 runs by then, nobody could have thought of anti-climax for the experienced Dhoni’s team specially when a man with world record 325 match as captain was on strike. But, Bravo did not read the record books. He just bowled one of the best T20I overs and Indian pair could only score 7 runs in the first 5 balls and the person known as Captain Cool got out on the last ball when India needed just 1 run to earn their 2nd T20I tie match, and 2 runs to register 3rd win over West Indies in 6th match. But, Bravo got his ex-IPL captain Dhoni caught on the last ball and West Indies registered their first 1 run win, and first last ball win in a T20I match against any team, in their 78th T20I match. Still, by the decision to award Lewis the MoM, the committee just proved what generally appears to be the belief of ICC. Cricket is all about batsmen. For them the last 3 overs did not matter. For them Bravo did not matter. For them the only thing that mattered was 2 centuries from both teams. The centurion from winner team was anyways their Player of the Match. Bowlers can just bowl for accolades. By popular notions the viewers felt that it was Bravo who made India lose and West Indies win in the run feast. But, ICC is the managing committee of Cricket and must be having much more technical acumen to consider a batsman as player of the match. Hopefully, bowlers also get their due better in future.